Collectors have long benefited from the profusion of broadcast Milstein material. The latest retrieval to come my way derives from Claves who have collated two concerto performances given five years apart at the Septembre Musical in Montreux. The first was the Lalo with Cluytens and then from 1960 we have the Brahms with the touring NDR under the excellent and sane Brahmsian Paul Kletzki. 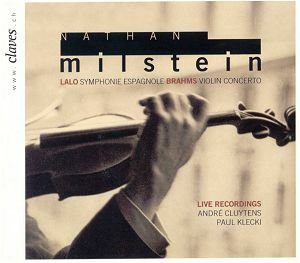 In common with most Auer pupils Milstein didn’t play the Intermezzo of the Lalo. He takes a little time to settle but once relaxed the playing is as suave and commanding as one could wish. Once or twice his tone becomes a touch glutinous – one senses the moments are gestural rather than inherently felt – but otherwise the precision and refinement of the playing are remarkable. It’s playing of captivating allure without exaggeration, as the second movement makes explicit, and the noble intensity of his slow movement is allied to expressive restraint. His pert portamenti in the finale enliven the playing still further. Milstein’s playing here is broadly comparable to his Philadelphia/Ormandy and the later St Louis/Golschmann traversals in purely technical and tonal matters. But this live performance has rather unflattering sound – it can impart a rather brittle sound to the strings of the Orchestre National de Paris, who are not in any case the most warmly expressive of groups. And orchestral discipline in the finale does sag – the ensemble is not as polished as it should be. That problem is not apparent in the Brahms concerto. I’ve always rather baulked at writer Henry Roth’s description of Milstein’s lack of “intellectualism” in this concerto. I’m not quite sure what it really means. One thing is for sure; his conception remained remarkably consistent over the years and you’ll find little variance of approach. More and more performances are being unearthed but if you know the Philharmonia/Fistoulari, the VPO/Jochum, the live Concertgebouw/Monteux or the Steinberg or the other survivals you will appreciate the unchanged conception. Maybe Roth was actually objecting to Milstein’s known and outspoken reservations about the work, as a failed emulation of the Beethoven. So, no revelations here – just freedom and flexibility, a well chosen and apt sense of tempo relationships, no distensions after the first movement cadential passage (unlike so many performers today) and superbly focused tonal qualities. The playing throughout is highly auspicious, unshowy, nobly grave and buoyant in the finale. There are some coughs from the audience and there’s some high level hiss but the sound is warmer than in the chillier Lalo. Certainly Milstein was no Henry Merckel in the Lalo, nor did his Brahms necessarily reach the level of Busch or Huberman. And it’s true that multiple recordings, studio and live, exist of his playing of both these works. So I suggest this is an ancillary disc for collectors – reinforcing the manifold pleasures of his playing in these two works.